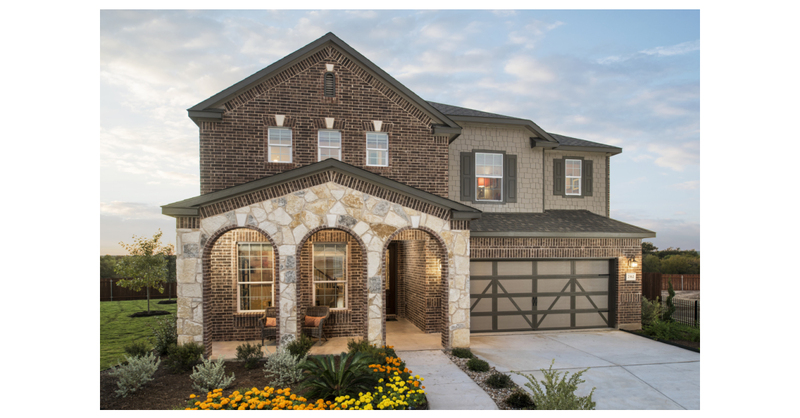 KYLE, Texas–(BUSINESS WIRE)–KB Home (NYSE: KBH) today announced the grand opening of Sunset Hills, its latest community of single-family homes in Kyle. Convenient to Interstate Highway 35, Sunset Hills offers easy commuting to major employers like Texas State University and Seton Medical Center Hays, and to retail centers such as Kyle Crossing, The Village at Kyle and Kyle Marketplace. Residents of Sunset Hills will enjoy the community’s proximity to Lake Kyle and Plum Creek Preserve, which offer a variety of recreational activities, including hiking, biking, fishing, canoeing and swimming. For golf enthusiasts, nearby Plum Creek Golf Course is a par 71, 18-hole championship golf course spread out over more than 200 acres. Community amenities include walking trails, a community park, playground and basketball court. KB Home will host a grand opening celebration at Sunset Hills on Saturday, October 13 from 12:00 p.m. to 4:00 p.m., during which attendees may tour the three elegantly-appointed model homes and enjoy food and refreshments. KB Home will be constructing one- and two-story homes and offering 16 distinct floor plans with up to six bedrooms and four baths. The homes range in size from 1,400 to 3,400 square feet and feature desirable design characteristics such as expansive great rooms, open kitchens and elegant master suites. Pricing begins in the mid-$200,000s. “At Sunset Hills, homebuyers have an opportunity to purchase a beautiful new home that is close to top employers and myriad local attractions and conveniences,” said Ken Langston, president of KB Home’s Austin Division. The KB homes at Sunset Hills will be built to current ENERGY STAR® guidelines and include WaterSense® labeled faucets and fixtures, meaning they are designed to be more energy- and water-efficient than most typical new and resale homes available in the area. These energy- and water-saving features are estimated to save homebuyers between $780 to $1,440 a year in utility costs, depending on the floor plan. As part of KB Home’s distinct homebuilding process, buyers may personalize many aspects of their new home to suit their style. After selecting their lot and floor plan, KB homebuyers may work with expert design consultants who guide them through every aspect of the process at the KB Home Design Studio, a retail-like showroom where they may select from a plethora of design and décor choices, including countertops, cabinets, lighting, appliances and window coverings. The Sunset Hills sales office is located 126 Azure Cove in Kyle, Texas. From Interstate Highway 35 North, exit onto Kyle Parkway and continue to the Interstate Highway 35 North access road. Turn right on Bebee Road and the community is on the left. The sales office is open Mondays through Thursdays from 10:00 a.m. to 6:30 p.m., Fridays from noon to 7:00 p.m., Saturdays from 10:00 a.m. to 7:00 p.m., and Sundays from 11:00 a.m. to 7:00 p.m. For more information about Sunset Hills or KB Home’s other new home neighborhoods, visit www.kbhome.com or call 888-KB-HOMES.